George Beecham was the son of Stephen George Beecham and Harriet Looker. Stephen, known as George, and Harriet were married in 1894, and George Jr was born the following year. A brother and sister followed. In 1897 at just twenty-one, Harriet died at Condah. The children went to live with Harriet’s sister Lottie and her husband Fred Franks. The Franks lived at Ballarat Road, Hamilton. On 20 March 1916, George enlisted at Hamilton. He’d worked as a lorry driver had also served with the Senior Cadets at Hamilton for two years. George had previously tried to enlist but was rejected on account of a skin condition. He went to camp with the newly formed 39th Battalion at Ballarat, before leaving for England on 27 May 1916. George arrived at Devonport, England on 18 July 1916 with the 39th Battalion. He left Larkhill, England at noon for France on 23 November 1916 reaching Le Havre at 1.30am the following morning. They made their way to Merris over the next three days where they were billeted for two days. Their introduction to France was a very cold winter. The first major battle for the 39th Battalion was not until the Battle of Messines in Belgium on 7 to 9 June 1917. 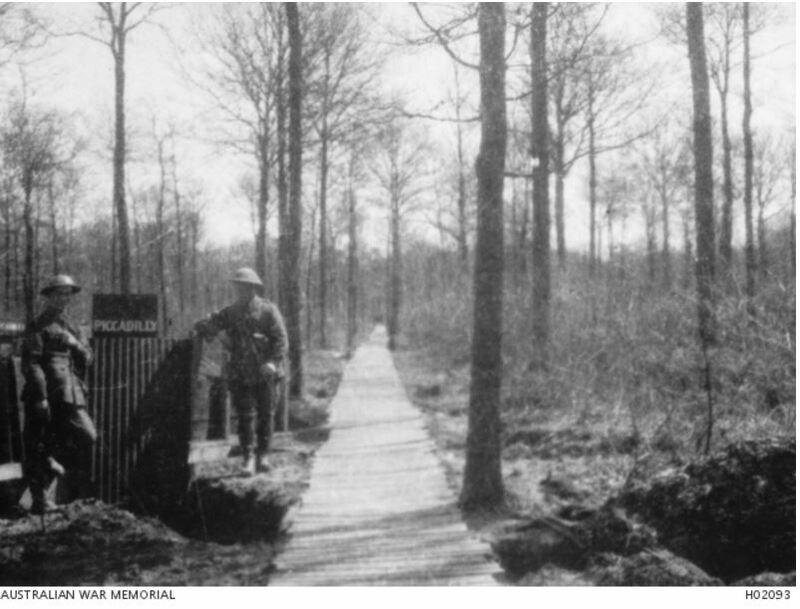 George was killed on the first day on 7 June 1917 at Ploegsteert Wood (below) only thirteen months after leaving Australia and six months in France. 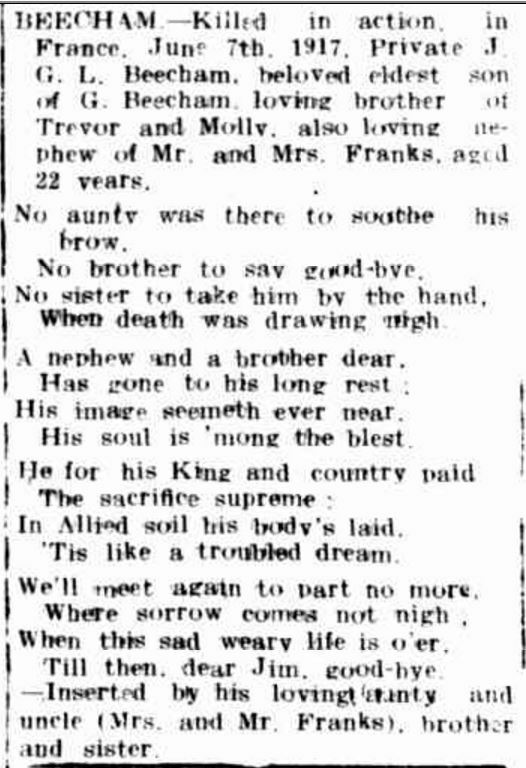 News of George’s death reached home and Lottie Franks placed a death notice for her nephew in the Hamilton Spectator. “KILLED IN ACTION.” Hamilton Spectator (Vic. : 1870 – 1873; 1914 – 1918) 3 Aug 1917: 2. <http://nla.gov.au/nla.news-article119854571&gt;. Attempts were made by Base Records to contact George’s father. George’s brother John advised them Lottie Franks had been like a mother to George Jr, however, Base Records wanted to find the nearest blood relative. In 1920, Lottie, then living at Gawler Street, Portland wrote to Base Records after a further enquiry from them. She advised them George Sr had been ill and advised to move north after which she lost track of him. She knew he’d been around Mildura during the fruit picking seasons but he didn’t keep in contact with his children. In 1922, a contact address was found for George Sr, c/o Newton Bros. Mildura. Finally, in 1922, George Sr wrote to Base Records and advised he was living at Watchem. The following year on 31 August, John Beecham wrote to Base Records to tell them his father was killed in an accident at Watchem. He advised that he would like all his brother’s mementoes to go to Lottie Franks.